IMPORTANT: due to Paypal removing the buy it now buttons from our Saved Buttons, we suspect, no notifications of purchases have been sent to us for some time. This is now corrected with new Buy It Now code. Minolta and Konica Minolta made some good accessory branded cases for early digital models like the Dimage 7 series. Guess what? These cases are a super fit for the latest Sony APS-C mirrorless range and even for some recent SLT/SLR models. For NEX/A-series the black CS-DG8 made for the Dimage models has the headroom needed to fit for example the electronic viewfinder on the NEX-5n, or any NEX with its flash. That’s because the Dimage models also had an electronic viewfinder, some hinged in a way very like the attachable EVF. It will fit the Alpha 55, Alpha 290 and similar smaller body models with smaller lenses. It also fits the RX10, and the full-frame A7 series with smaller (usually prime) lenses. 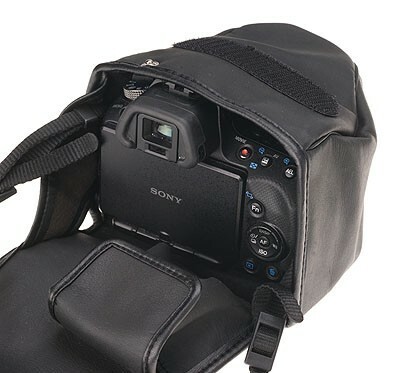 The case has a battery pouch which fits a spare NP-FW50, and both belt and camera-strap retaining loops. The NEX-5n with 18-55mm fits comfortably in the CS-DG8, and (below) there’s plenty of space with the EVF attached. 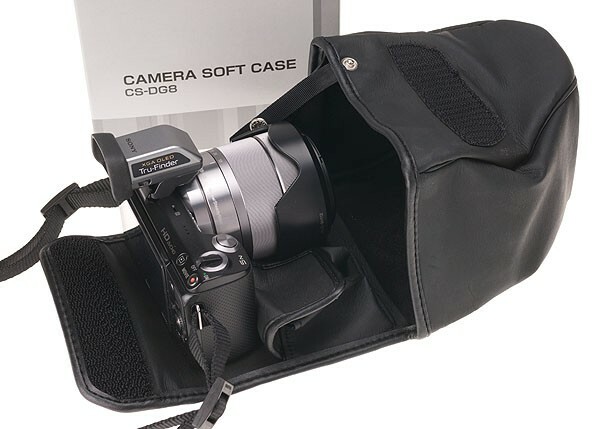 The leather-look (synthetic) camera pouch CS DG-8 will fit some larger current cameras with small lenses, but is most comfortable with smaller bodies and ideal for the NEX models with 18-55mm zoom. Inside the case lid is a pocket which can fit one or two NP-FW50 batteries, or memory cards. It will accept any NEX body with or without viewfinder or flash attached, with the kit zoom, 24mm f/1.8, 50mm f/1.8, 30mm macro, 16mm with converter, Sigma 19mm or 30mm and comparable lenses. It will not fit the 55-200mm, 18-200mm. The CS-DG8 is only £20 (approx $24) including postage and tax where applicable, anywhere in the world. 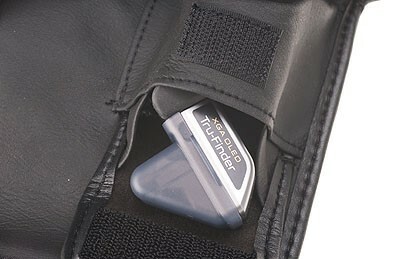 The EVF TruFinder for the 5n (etc) can be stored in the battery pouch. A sewn, fixed belt loop gives great security. The Alpha 55 will fit (as will similar smaller DSLR/SLT models, when using a prime lens such as the 30mm macro, 35mm f/1.8, 50mm f/1.8 or 85mm f/2.8). The NEX/A6xxx bodies are a very comfortable fit in the DG-8 with the 16-50mm kit lens, 50mm f1.8, 24 mm f1.8, 35mm f1.8 and similar lenses. This case will also fit the Dynax 5D or Alpha 100/200/300 series with 50mm f1.7, f1.4, 28mm f2 or 2.8, 35mm f2, 50mm f3.5 macro, 24mm f2.8 or similar size of wide-angle to standard lens (not a zoom). 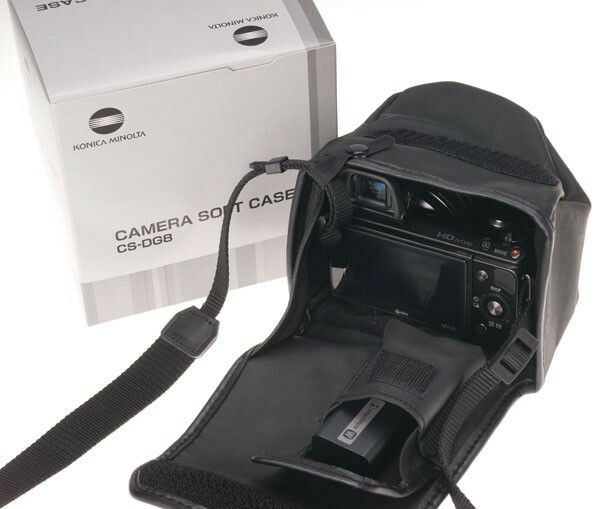 Ideal for many smart phones, this belt-looped velcro fastened leather case was made for the Dimage G500, G600, G400, G530 and similar shaped cameras. It costs £15 ($18) including worldwide post and VAT where applicable. This case will fit most full sized iPods, and the hole in the top flap designed for the camera’s strap is perfectly placed for the earphone cable. It is NOT large enough to fit iPhones from gen 4 onwards. It has an internal pocket which is a tight, secure fit for a credit or similar card (or folding money). Internal dimensions – 55mm wide, 25mm thick, 90mm high. Soft velour inner lining, velcro front flap fastening. Real leather not artificial. Konica Minolta logo. It’s very hard to get mobile phone cases which fit your belt – if your phone is the right size, this case can help you make sure it’s with you when you get a call. Please note that the RX100 is too large for this case, may look otherwise but it’s 101 x 58 x 35mm. The CS-DG1000 case for the Z-series is actually a versatile ‘crushable’ all round case suitable for flashguns and lenses, and also useful with almost all the mirrorless models, the RX1 and RX100 series. This accepts all Z models from Z1 to Z6, and many other similar cameras. It can be belt-mounted or attached to the supplied shoulder/neck strap via two rings, and it has a twin zip so it can easily be opened from either side. This case is great for travel and for general outdoor work with two or more lenses – you can wear two or three CS-DG1000 cases or strap them back to back. It is also an excellent belt case for items like flashguns, or lenses such as the 24-105mm or 50mm macro; it will fit the 11-18mm or 17-35mm, 24mm f/2, 16-35mm, 16-80mm, 16-50mm and most similar lenses with lens hood attached and reversed. It is a perfect case for the 36/42/43 series flashguns – the battery pocket inside even fits the shoe stand. It costs £15 (about $18) including postage, and VAT where applicable. Here is a vintage strap from the days of the Dynax/Maxxum xi models, with a sewn-on Creative Expansion Card case. Our price £15 (a mere $18) shipped anywhere, including VAT where applicable. THIS STRAP’S WALLET IS AN EXACT FIT for Sony Memorystick Pro Duo cards. It will hold six Memorystick Pro Duo cards in individual slots. It will not hold SD cards, they are too large. 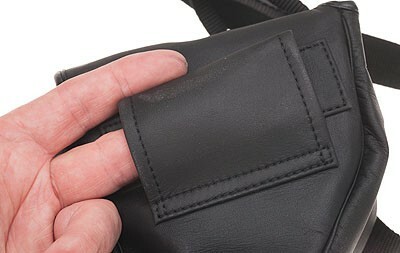 STOP PRESS: the wallet slots are also an exact fit for Multi Interface Shoe (the current Sony flash shoe) cover insert. You can store this vital protective cover safely as well as carry emergency MS Pro Duo storage. These straps are much softer and more comfortable than the new Sony straps. It’s easy to cut off the memory card wallet if you do not want it. 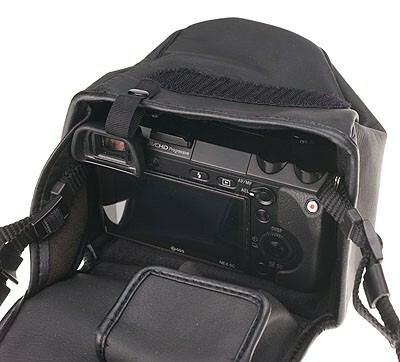 The strap is not only wide, and soft fabric which can be wrapped round the camera to protect it, it’s also 120cm long (after allowing for securing). The fabric has a slight degree of give which prevent strain on the neck or shoulder.